Arrow pushing (why never pulling?) is a technique learnt by all students of organic chemistry (inorganic chemistry seems exempt!). The rules are easily learnt (supposedly) and it can be used across a broad spectrum of mechanism. But, as one both becomes more experienced, and in time teaches the techniques oneself as a tutor, its subtle and nuanced character starts to dawn. An example of such a mechanism is illustrated below, and in this post I attempt to tease out some of these nuances. The example chosen is the reduction of a carboxylic acid to an alcohol by borane (diborane). Lecture notes present this reaction as being specific to carboxylic acids, even in the presence of carboxylic esters. The tutor is then faced with how to explain this selectivity to students in a tutorial, using arrow pushing. Scheme for reduction of a carboxylic acid by borane. The essential arrows (red). 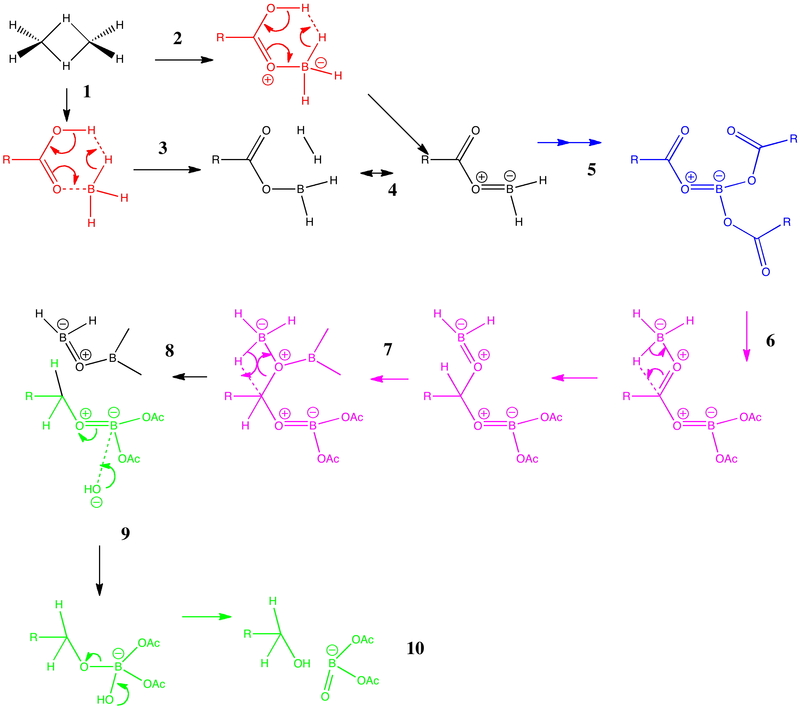 These will attempt to describe the key mechanistic step for which an answer is sought, in this example why the reaction is so selective for the carboxylic acid. A cruder, but perhaps pragmatic description is that these are the arrows needed to pass examinations in the subject (music to students’ ears). The lazy arrows (blue). In this case, these arrows are essential to “prep the patient”, but they will not of themselves carry much insight into the operation of the mechanism. The workup arrows (green). To continue the medical analogy, this is a post operative “closing the patient up” stage. This tutorial actually starts with non-arrows. Process 1 involves converting the actual real structure of diborane (a bridged dimer) into its monomer, which is thought to be the active ingredient of this reagent. Because the bridging hydrogens are bound by three-centre-two-electron bonds, it is actually difficult to represent this process with conventional (two-centre-two-electron) arrows. So we do not even try! Process 3 is the one which involves the essential (red) arrow pushing. 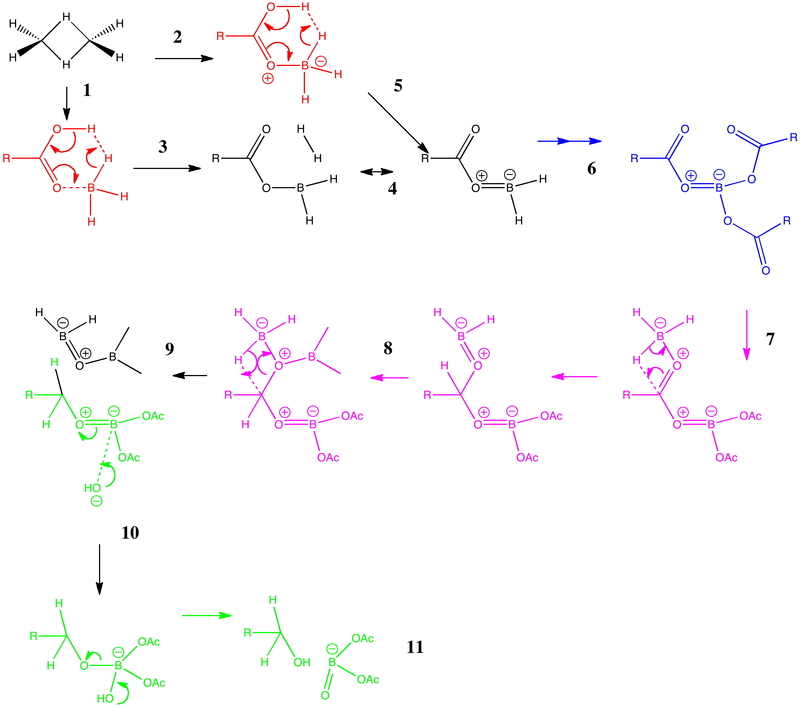 It encapsulates the reason why only a carboxylic acid reacts in this process, and these arrows can be formalised by computing the transition state quantum mechanically (below). In fact there are two ways of illustrating this essential process. Process 2 involves first forming a O-B bond before the essential arrows. Process 4 involves another B-O bond AFTER the key transition state; the outcome of either process is identical. This illustrates another subtle behaviour in arrow pushing; the detailed timing or choreography of the arrows. In this example, the animated form of the reaction coordinate indicates relatively little B-O bond formation, so we will go with 2 and then 5 as the more realistic representation. 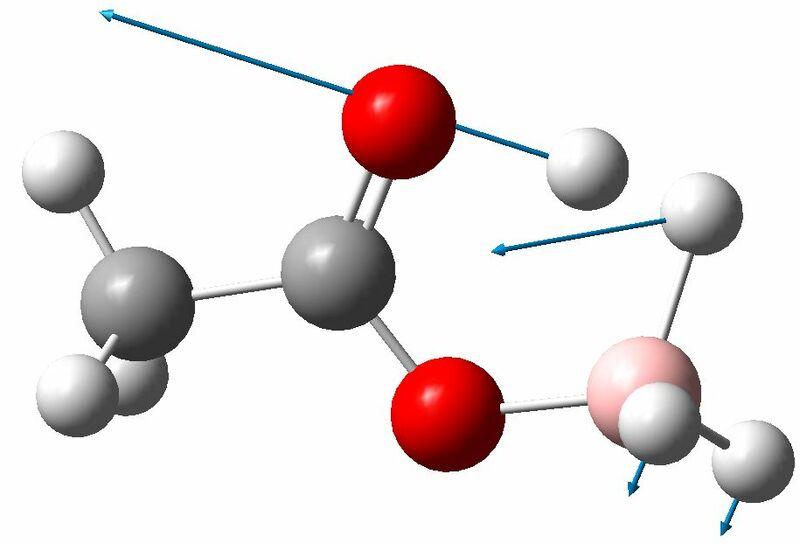 In fact, the QM transition state is fascinating in its own right; note for example how one of the two extruding hydrogen atoms is moving far less (the hydridic one) than the other (the proton-like one; full details available at 10042/to-5725). Key transition state? Click for 3D. Process 6 is a lazy category. The preceding steps are simply repeated twice more to form a triacyloxyborane. There are many other forms of lazy arrow. Proton transfers are often thought of in this category, and double headed arrows involved in addition/elimination to e.g. carbonyl groups. Process 7 and 8 are in an awkward category. Of themselves, they do not explain the selectivity of borane for this functional group, but they do represent another essential operation; namely the actual reduction of the carbonyl group. They are also somewhat speculative, and it is quite possible other routes could be devised. Finally, with 9, we arrive at a resting phase which now requires workup (green). Thus 10 and 11 represent hydrolysis of the borate esters to the reduced alcohol and something starting to resemble boric acid. Clearly, more arrows are needed after 11, but few tutors (or examination graders) would begrudge a student if these were to be omitted. Step 11 also contains some lazy arrows, since a proton is transferred between oxygen atoms, but no arrows are shown for this process. Clearly, there are plenty of nuances here, and it is perfectly possible that other arrow-pushers may even disagree with some of the ones I have shown above. But perhaps the above analysis might give you some ideas of your own on how to communicate the essential of reaction mechanisms to others. This entry was posted on Wednesday, December 1st, 2010 at 4:48 pm and is filed under Interesting chemistry. You can follow any responses to this entry through the RSS 2.0 feed. You can leave a response, or trackback from your own site. The most noteworthy feature is the OH…HB distance, which is 1.55Å. This is an unusually short H…H contact (the non-bonded van der Waals distance between two such atoms is normally taken at around 2.2Å). Such interactions are often called dihydrogen bonds, but this certainly is an unusually short example of such! The free energy of activation between this species and the transition state for extrusion of H2 is only 6.9 kcal/mol. See also this recent article on hydroboration reactions, and the ability of transition state theories to describe them, and this post. Hello! This is an excellent mechanism, as finding a proper mechanism for the reduction of carboxylic acids by borane is almost impossible to find on the internet. Organic chemists don’t seem to be too fond of reaction mechanisms with inorganic reagents. Nathanael raises an interesting question, which I think might be summarised by the three possibilities shown below. (a) involves no prior coordination of the borane to the carbonyl, whereas (b) does. (c) involves prior coordination to the hydroxy group, and elimination of dihydrogen via a 4-centered transition state rather than six. Computation is good at answering this sort of question. Firstly, (c) is found to be 26.6 kcal/mol higher in free energy than (a/b) (see 10042/to-9435). So whilst the borane might be better at coordinating onto the hydroxy group, the subsequent 4-centre transition state is much less favourable than the 6-membered one. The issue of (a) vs (b) can be addressed by computing an intrinsic reaction coordinate, shown below. The transition state is the maximum in the middle. On the lhs we have the product, in which H-H is eliminated. On the rhs we have the reactant, which in fact resembles (b) more than (a) (the O…B bond is 1.62Å). Note also the relatively low activation barrier for elimination of H2 (~8.2 kcal/mol). 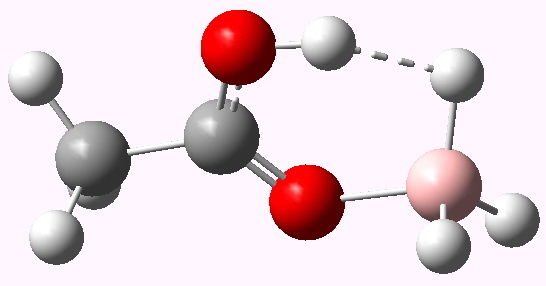 There is another feature, being an inflexion point on the lhs, which reveals a tendency to form a 5-coordinate boron on the way to elimination of hydrogen gas. These types of feature have been noted in another post. And to complete things, the below shows an animated IRC for (c). 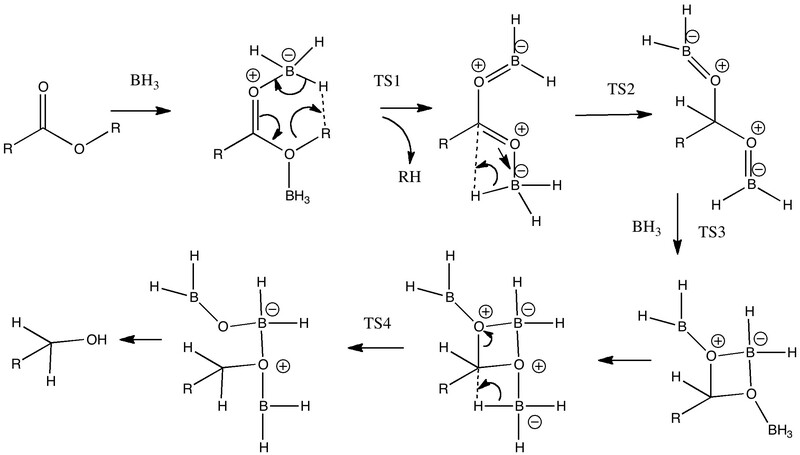 This reveals that the approach of BH3 to the carboxylic acid is in fact synchronous with elimination of H2; there is no prior coordination between B and O.
Anatomy of an arrow-pushing tutorial: reducing a carboxylic acid. is licensed by Henry Rzepa under a Creative Commons Attribution-Noncommercial-Share Alike 3.0 United States License.